Part of Urban Infill Art In The Core; empty+active spaces in the downtown will be converted into arts/cultural spaces with over 350 artists converging to exhibit their art for one of the largest multi-disciplinary art shows in the City of Thunder Bay. 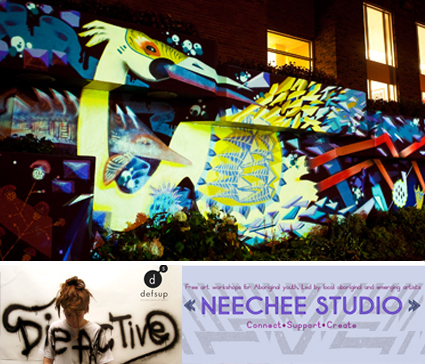 The Definitely Superior Art Gallery’s Die Active Art Collective and Neechee Studio Aboriginal Youth Group represents two aspects of some 18 projects. Look for live painting on a wall over the course of the night-participate! Locations in the core generously donated and found in multiple spaces in the Tomlinson Block-[corner of Red River and Cumberland]+[former Treasure House 232 Red River Rd.] Pick up your map at DefSup and then follow the Tour Guides to all the exciting Urban Infill locations, re-discover your Downtown Waterfront District through art & culture.